Jubb & Cois committed to protecting and processing your personal data in accordance with the General Data Protection Regulations and the Data Protection Act 2018 (the legislation). 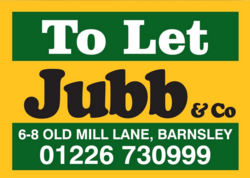 For the purpose of the legislation and your personal data, Jubb & Co, is the Data Controller, Caroline Jubbis the person responsible for data protection and can be contacted at 6-8 Old Mill Lane, Barnsley, South Yorkshire, S70 2LA (Tel: 01226 730999). The personal data we process may include the information in column A of the attached appendix andsensitive data including health if applicable. We may also hold copies of certificates or other evidence of membership of a professional body or trade organisation. Where the provision of data is a statutory, a contractual requirement or a requirement necessary to enter into a contract, a refusal to provide the data may mean that we are unable to engage with your service. To ensure that we provide the best service possible we will need to collect and retain certain personal data. The data may be collected and processed by those listed in columns B and F. How we source the data is identified in column C. We may source data from third parties or via third parties e.g. trade bodies. Where we state that we have a legitimate interest, the fact that we have a legitimate interest and what that legitimate interest is, will be stated in column E, e.g. to keep in touch with you when we need it to contact you; fulfilling our legal and contractual duties. It will be necessary for us to process or share all or some of your personal data with a range of individuals, businesses and organisations and these are listed in column F.
We will retain some elements of your personal data for up to the time defined in column H after we cease engaging you as a contractor. The information which can be anonymized will be that which is no longer required for either contractual fulfilment or a legitimate interest. If the lawful basis for processing your data was consent then you may withdraw such consent at any time.